At the sectoral side, the assessment of prospects of investment in the IT sector has updated its own record of the previous month (145.5) and amounted to 146.2 points. Respondents remain consistently optimistic about investments in agriculture – the value of the corresponding sub index is 136.2 (compared to 135.5 a month earlier). Attractiveness of industrial investments is at the neutral level (100), while assessment of prospects of the trade and services sector significantly increased – for the first time since last June, it exceeded 100 and climbed up to 107.7 points. In terms of instruments, the respondents positively perceive opportunities related to both investments by private equity funds (108.3) and investments by strategic investors (107.7). At the same time interest in bonds and shares of Ukrainian companies plummeted. Investors have significantly cooled in their attitude to investments in fixed-income instruments – for the first time since last August the bond sub component of the index appeared in the negative zone with the value of 97.5 (down by 27.5 points). Equally sharp (down by 21.4 points) was the change of sentiment towards investment in equity, amounting to just 60.5 points. A lower score was recorded only in the context of investment strategies – conservative investments is perceived even less promising than before, receiving just 53.9 points. The opposite trend is demonstrated by the aggressive investment strategy – it has not only preserved its high level of attractiveness, but gained a record high estimation at 141.7 points (maximum value for the entire period of observation). Moderate investments are in the negative zone for the fourth consecutive month with the current value of 91.7. 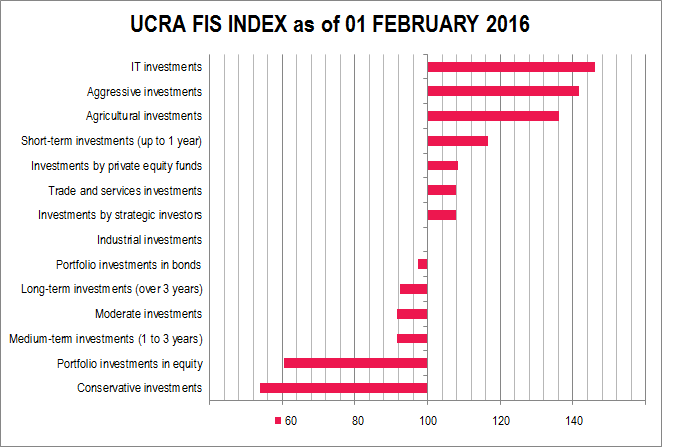 UCRA FIS INDEX (Foreign Investor Sentiment Index) for Ukraine is a joint project of Ukrainian Credit Rating Agency and TRDATA UKRAINE. The index is calculated on monthly basis through a survey of the leading investment and consulting companies that assist in channeling foreign investments to Ukraine in order to assess the willingness of foreign investors to provide funding for Ukrainian companies during the next month. The resulting survey data is compared with the changes of the key market indicators for the previous month. The index calculation was carried out in the test mode since the beginning of 2015. 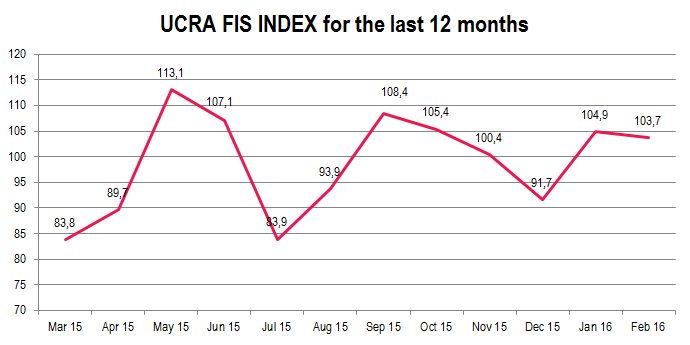 Publication of the index commenced October 1, 2015. A reversal occurred in the attitudes of the respondents with respect to the investment horizon – prospects for short-term investments in Ukraine (116.7) are now perceived better than potential benefits of long-term (92.3) and medium-term investments (91.7).